In this unit we are looking at 3D shapes. Identify the properties of a 3D shape. Recognise the nets of 3D shapes. Pyramids ... Where in the world? Discovering measurements and cultural significants of pyramids in Asia. Three-dimensional geometrical shapes occur in nature in crystals of substances. Some of these shapes are commonly used in monuments and sculptures and in the architecture of buildings and other physical structures. Ancient man-made pyramids are found in many parts of the world and in some cases the cultural and archaeological significance of these is still being studied. List where in the world you would find big pyramid-shaped structures. Pyramids in Asia: There are some significant pyramids in Asia ... even some that are under water! With your shoulder partner, make a list of pyramid-shaped structures and their country location in Asia. Choose one Asian pyramid to research in some detail. Use of mathematical language to be precise about the shape and nature of the pyramid. A net of the pyramid. Details about the size of the pyramid compared: Its base measurements and height. The age of the pyramid. The historical or cultural significance of the pyramid. We are going to discover the 5 platonic solids and use Euler's formula in an investigation. If you can use Euler's formula to identify the 5 platonic solids. If you can define the term congruent. iValue: I Work well with others. Example: each face of the cube is a square. They are also convex (no "dents" or indentations in them). Why such a funny word that basically means "equal"? It comes from Latin congruere, "to agree". So the shapes "agree"
Congruent shapes are the same size and shape. 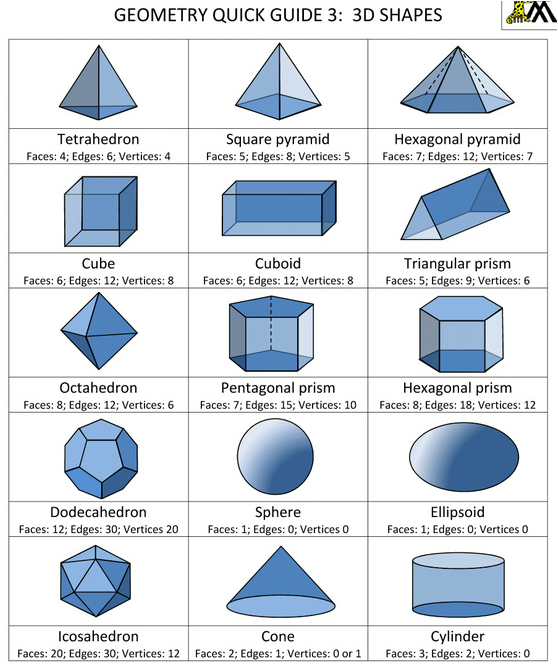 If shapes are the same shape but different size, they are called similar. Euler has developed a number of different formulas. His most famous is Euler's Identity, which you might like to research on your own. We are going to be focusing on Euler's formula that is used with 3D shapes. Use Euler's formula to investigate the following shapes. Can you identify which are the 5 Platonic solids? Use a Venn Diagram to organise your shapes. Made up of regular polygons. The beauty of 3D shapes. A hexahedron is a 3D shape that has 6 faces. 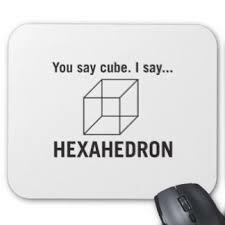 A cube is one. As an extension can you draw the other 6.